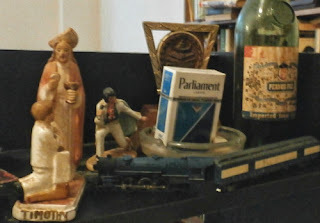 Mementos from my past: N.J. Blue Comment N-scale model railroad locomotive and passenger car, Statuette commemorating my first holy communion, Elvis Presley Statuette I bought on my first business trip, to Las Vegas, Poetry Award Trophy I received in 8th grade, a bottle of Pernod whose story is way too personal for me to ever tell you, and in an ashtray stolen from a Hilton Hotel, my last pack of Parliaments, still unopened. I don’t know why, keeping this unopened pack in this ashtray keeps me from smoking. Maybe sometimes I contemplate opening it, or maybe there will be some personal crisis justifying a smoke, which hasn’t happened but maybe having the possibility gives me a sense of security that keeps me from smoking. I take the picture of my last pack every once in a while, especially on this day. I plan to be buried or cremated with it. Cigarettes I miss you and will love you always. I have never and will never ask anyone to stop smoking or put out their cigarette. I love the way smoking looks and I love smelling smoldering tobacco. Anti-smoking laws are fascism. However, I am glad and thankful not to be addicted to nicotine and that is the God’s honest truth. Unlike many ex-smokers, I can not have the occasional cigarette or smoke only while I’m on vacation. One is too many and three packs are not enough. I loved to smoke; I had to smoke. I still have the love, but I am glad I don’t have that physical need. I no longer have to smoke. If I can quit, anyone can, but I had no choice. Four years ago today I exhaled the delectable fumes of my last cigarette as I passed through the glass emergency room doors of Liberty Medical. I smoked on the way to my heart attack. Like I said, I miss smoking, but I do not miss being addicted. I think about how I almost died four years ago today and all the things I would have missed or not have written or books I would not have read and most of all, all the friends and family I wouldn’t have hung out with and I honestly admit, that is way better than smoking… most of the time.